Last Friday, the New York City Economic Development Corporation (NYCEDC), along with the Departments of Housing Preservation and Development (HPD) and Parks and Recreation (DPR), announced a massive new project in the South Bronx spearheaded by L+M Development Partners. 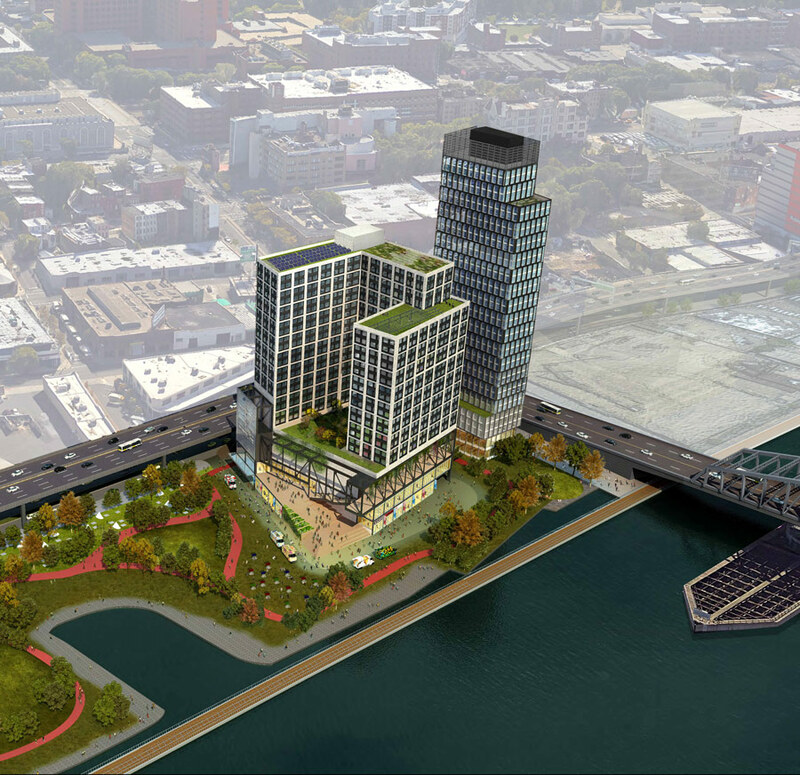 Dubbed Bronx Point, the project is located on city-owned land on the waterfront of the Harlem River, and will include about 600 units of affordable housing in phase one (1,045 units total) as well as the nation's first brick-and-mortar hip-hop museum, officially called the Universal Hip Hop Museum. Among the founding members of the museum are recording legends Kurtis Blow and Rocky Bucano; its cultural ambassadors include Big Daddy Kane, Rakim, LL Cool J, and many other recognizable names. Law and Order: SVU's Ice T is on the board of directors. Executive Director Rocky Bucano said the museum's goal was to bring "hip-hop back to the Bronx where it originated from [...] it's gonna be a complete history of hip-hop." The site of Bronx Point is located adjacent to the 149th Street corridor, making it very transit-accessible. Additional plans for the property include a public multiplex theater, a waterfront esplanade extending to Mill Pond Park, an outdoor performance space, an incubator for small food vendors, and educational spaces in partnership with established organizations like Billion Oyster Project, City Science, and BronxWorks. The project is projected to produce over 100 new jobs (and 915 temporary jobs during its construction) during phase one alone. It also aims to incorporate sustainable building practices for LEED Gold certification. Once approved, phase one is slated for completion in 2022. The proposal for Bronx Point has entered the Uniform Land Use Review Procedure (ULURP) with the support of Bronx Borough President Ruben Diaz Jr., Community Board 4 District Manager Paul A. Philps, and the City Planning Commission ... not to mention Detective Tutuola. The Embassy of the Republic of Korea (ROK) has donated two parcels of land in Arlington County, Virginia’s Courthouse area, and now the county is reaching out to the community for help in designing its first temporary pop-up park. 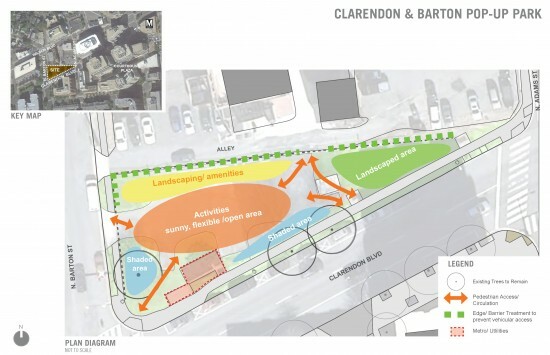 The Departments of Parks and Recreation and Community Planning, Housing and Development have devised a survey to determine how the public would like to use the new open space on Clarendon Boulevard. Features already planned for the park include ADA accessible paths, an assortment of moveable seating, a modest grass area, and a landscaped barrier between the alleyway and open space. Oddly shaped and along a main commercial street, the third-of-an-acre property is within a dense area and is expected to have a great impact by providing immediate reprieve to neighboring residents. Based on public feedback, the park could have short-term recreational facilities and space for small-scale games. Possibilities also include areas for food trucks, vendors, and temporary outdoor markets. The county plans to preserve several shade trees and improve site drainage. To emphasize the impermanent nature of the park and to reduce construction costs, a portion of the building materials will be recycled from existing surplus materials in Arlington County. Since permanent alterations to the site will require approval from ROK, enhancements will generally consist of surface improvements designed to curtail any need for excavation, thereby permitting the park’s features to be re-utilized at other locations. While the land was offered rent-free for a two-year term, the property can be used by the city until ROK or the county terminates the contract. The topic is still open for public input. To make your voice heard, participate in the survey before the August 19 deadline.